A group of twelve artistes passed through Kigali, as they travel the length of Africa, from the Cape to Cairo, in what they are calling The Great African Caravan, to promote among other things, Sustainable Development Goals, or SDGs, and global citizenship. The twelve artists are drawn from four continents, and include a poet from Uganda, a photographer from Germany, filmmakers from India, an actress from Kosovo, musicians from Argentina, and Great Britain. The twelve collaborate with their counterparts in each country they visit along the chosen route, and they expect to work with over 1,000 artists, in these countries. So why The Great African Caravan, why not the Great Asian, or European Caravan for instance? As he explains, the vision is for these Caravans to happen too, but, he felt African should come first. The group’s adventure is not without hardship. The Indian motor manufacturer Mahindra is sponsoring them, but, only with vehicles, all other expenses, including fuel for the gas guzzling 4X4s have to come out of their pockets. They are short on money, so much so that they don’t always have enough to buy all the food they need. The food they do have can get monotonous, at times hilariously so. They now know several names, in several languages for Ugali (Kiswahili), for a type of polenta made from maize flour. At first, entering one country in Southern Africa from another, the different names for this readily available, affordable staple, led them to believe they were getting something different to eat, only to realise that they had ordered the exact same thing, and only the name had changed. Yet, they will not charge a ticket price for their highly professional, highly polished, and certainly uplifting performances, contenting themselves to ask their audiences to please donate “what you feel you can, to help us buy fuel”. Should you come across the Great African Caravan, feed it, though not Ugali, and do go and see their show. You will find entertaining and instructive. Rwanda was not originally on their itinerary, because as they explained, the route through South Sudan would have been shorter. But, thanks to the current conflict in the country, their loss was Rwanda’s gain. Kigali DJ, and Events organiser, Eric Karengera-Kirenga, better known as Eric Soul of Afrogroove, was the group’s facilitator and host in Rwanda. He believes that in spite of the short space of time the group was in the country, something of value, and long lasting has been left behind. “For the artists involved, it is a long lasting transformational experience. We were able to show how creative design and thinking can implement high value projects that most would have perceived as unaffordable utopia. Imagine financing the production costs for three venues, transportation, and accommodation for twelve people, mobilising more than twenty-five local artists, including ten international artists, to work for a whole week, promoting and marketing two events…we were able to do all this without a budget, and we reached a bigger audience, and will make a greater impact than the hugely expensive events like Festpad, or African Move Academy Awards, which are so poorly organised, marketed and attended, that there is a risk of damaging the credibility of the entertainment scene in Rwanda”. And he is particularly pleased that the group felt at ease and relaxed in Rwanda, and but for one fly in the ointment, their Rwandan experience might have been perfect. “We had been hearing about how peaceful, safe, and great Rwanda is” said Feroze, “and it has been all of those, except, the irony is that it’s the only place that one of the group had their phone stolen”, he added ruefully. There is always one, unhappily. But, there is still a chance for their Rwandan experience to be perfect. If the phone thief is reading this, do please contact KTRadio, hand in the phone, and it can be reunited with its rightful owner. Perhaps you slipped it into your pocket by mistake, stranger things have happened. But for this kleptomania, the group’s only complaint about Rwanda, would have been the long wait on the boarder, as their many bags were searched for plastics, which are banned in Rwanda. Given the group’s commitment to SDGs however, it was an inconvenience they endured cheerfully. The Great African Caravan will conclude in Egypt in March, after which there will be a summit, bringing together all the artists it has connected, to think of ways of continuing the networking, and how to take the Caravan to the remaining continents. “I want to look ten years down the line” says Feroz, “when we can say that we have a network of artists, talking very strongly on geopolitical ideas of how do we envision the world together…I don’t know how it’s going to evolve…I would like to keep it open, every idea and philosophy, including the Caravan, that’s the idea of success for me”. 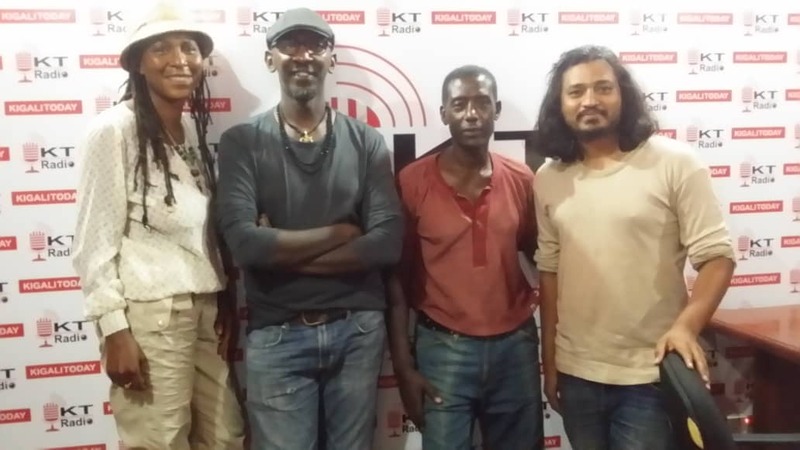 You can hear the full interview with the Great African Caravan artists on Rwanda Beyond The Headlines, which airs on Sunday, 8pm, 96.7fm.